Freestyle cruising, them marketers on Norwegian Cruise Lines call it. But as we waited in Boston Harbor to cast off for Bermuda aboard the M-S Norwegian Dawn, freestyle cruising apparently is mostly about being loud. Up on Deck 13 the bon voyage party was in full swing. The cruise director Johnny Cash Sanchez (yes, that’s his real name) and band have much of the teens, preteens and young adults aboard boogying to some frankly dreadful music, like “YMCA” by The Village People. Hamburgers and corn on the cob there are aplenty. 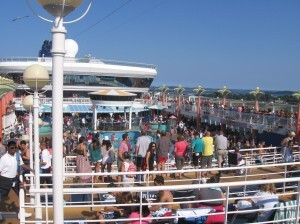 Most of the people on the deck are dressed for weather ten degrees hotter. The weather in Boston is spectacular: blue skies, but with the weather in the mid seventies it is not quite bikini weather. Finally, about an hour later than scheduled, our thousand foot long behemoth cruise ship finally leaves its birth. Accompanied by the usual pilot boats but also state police boats, we slowly move out into Boston Harbor, our fourteen decks such an obstruction that we temporarily shut down a runway at nearby Logan airport lest an aircraft graze our mast on approach. We last cruised fifteen years ago. We were overdue to reconnect with the cruising lifestyle. Fifteen years ago this size of cruise ship was more on the drawing board than at sea. Today it is a run of the mill cruise ship: supersized for the supersized Americans it carries. We are still astonished by the M-S Norwegian Dawn, built in 1998: its length, its girth, the number of decks, its opulence, and the attention to every detail. The cruising industry must be extremely competitive. This is good for customers. This seven day cruise was surprisingly affordable. Fifteen years ago a stateroom with a window was too expensive for us. Today with discounts we were able to book a stateroom with a view, roughly 200 square feet, for about $2300, about $600 of that just in port taxes. It is clean, comfortable and with our window it offers a hypnotic view of the sea rushing past us. 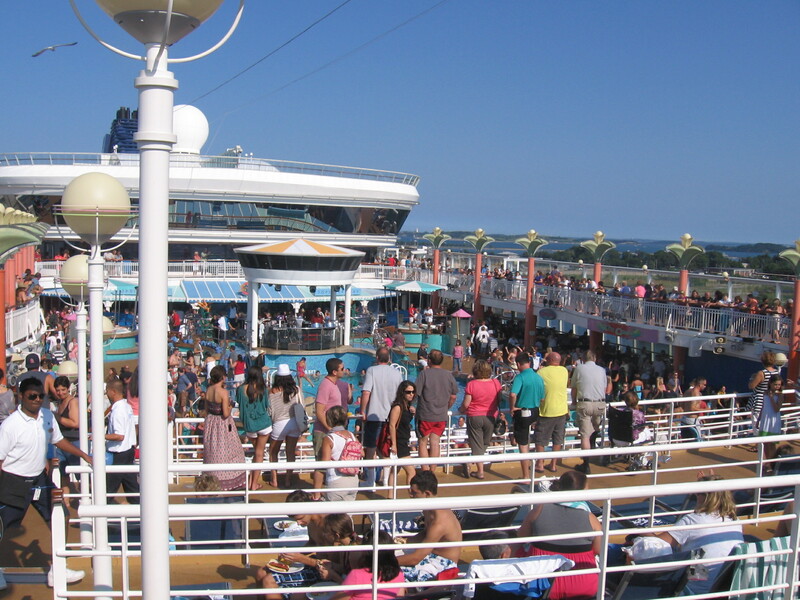 Norwegian Cruise Lines wants us to know that everyone is at our service, and they sure are. It’s almost a fetish. As we pulled out of Boston Harbor Friday night, we enjoyed our first dinner in the Aqua Dining Room where we were obsessively fussed over. My wife’s sensitivity to pepper resulted in entrees that were made especially for her devoid of them. It was hard to take more than two sips from my water glass without a server trying to refill it. After finally deciding on chocolate cake for dessert, I made the mistake of telling the waitress I thought about of getting the apple pie instead. She brought both. It’s no secret that food is plentiful on cruise ships. The most daunting task in this life of leisure is not to overeat. Judging by the girth of most passengers and their heaping plates of pizzas, burgers and fries, they will fail at this task. Twenty four hour buffets allow not just constant grazing, but constant gluttony. Having sampled the buffet for lunch, I found I preferred sit down restaurant instead with tastier entrees and smaller portions. Top tier dining on the Norwegian Dawn comes at extra cost and requires reservations, but the main dining rooms Aqua and The Venetian won’t leave you feeling cheated. The Venetian restaurant offers a breathtaking view of the ship’s rear. We happened to get the table at the very back and center of the ship. Both the Venetian and the Aqua are classy places to dine; gorgeously arranged rooms and with linens replaced with each set of customers. The Venetian comes with its own pianist in a tuxedo with an appreciation for popular musicals. Yet I have had better dining on other cruise ships. The best dining I ever had on a cruise ship was on our first cruise in 1995 aboard the late Dolphin cruise line’s Seabreeze I, an ancient ship by cruising standards (built in 1958) but blessed with gourmet cuisine. True story: the S.S. Seabreeze I now rests on the ocean floor off the coast of Virginia, having succumbed to rough seas on its way north for a refitting. Those older ships were missing stabilizers now common on cruise ships. The result was I spent a couple of days on that cruise seasick. Aboard the Norwegian Dawn, seasickness is not an issue. I get more turbulence on a gentle airline flight. It helps that the ship has stabilizers and that the Atlantic Ocean is relatively calm: four to six foot seas on our journey to Bermuda. There is a gentle swaying of the deck, but nothing that triggers any feelings of seasickness. Bonine is available in our stateroom just in case. Everyone is at your service, but that doesn’t mean that they are not also looking for ways to get into your wallet. The principle method is to keep you plastered at one of the eight bars across the ship, but there is also the compulsory casino, bingo and duty-free shops where you can buy likely very nice but much overpriced jewelry. We won’t be adding much to their bottom line, as we tend toward being abstemious and gambling simply does not interest us. A massage does very much interest my wife, so this will be our one indulgence with this cruising vacation. I wonder when a cruise company will take this “at your service” fetish to the next level. There are already cruises for swingers, so apparently cruise ship staff can work inured among naked clientele. Why not enhance the bottom line and offer prostitutes as well? After all, once you are in international waters the cruise line is free to decide what they will allow. I am sure there are plenty of undersexed people on these cruises who might want to get back in touch with their libidinous natures. Such a service would give room service a whole new meaning. I did not need a prostitute but we did very much need a vacation. If we have a problem it is that we do not take more vacations. We live our lives generally stuck in the rut of working, paying bills, doing chores and when leisure allows surfing the Internet. Surfing the Internet here aboard the Norwegian Dawn is generally a privilege for those with deeper pockets than ours. Per minute rates range from forty to 75 cents a minute. So we will wait until we are in Bermuda and find an affordable Internet café. For me, the most important aspect of cruising is simply communing with the sea again. By nature I am not a beach person, but there is something awesome and humbling about being a speck of a boat in an immense ocean. Cruise satisfaction for me simply comes from having a deck chair, a book and a nice view of the ocean. I treasure the gentle sound of the waves moving past the sides of the ship, the gentle slow sway of the deck beneath my feet and the meditative feeling that comes from standing while holding on to a handrail and gazing out at the immensity of the ocean. Next: a report on Bermuda. P.S. To Laura, from Terri: I am a medium well and having a wonderful time. re the PS: Glad to hear it!